Each week, Denise ate Girlie on the Edge hosts the Six Sentence Story link up. It's an enjoyable challenge: to write a sentence of only six sentences, based on the prompt word. This week's prompt is "crunch." Walking to her apartment after class one day, she was struck by the beauty all around her. 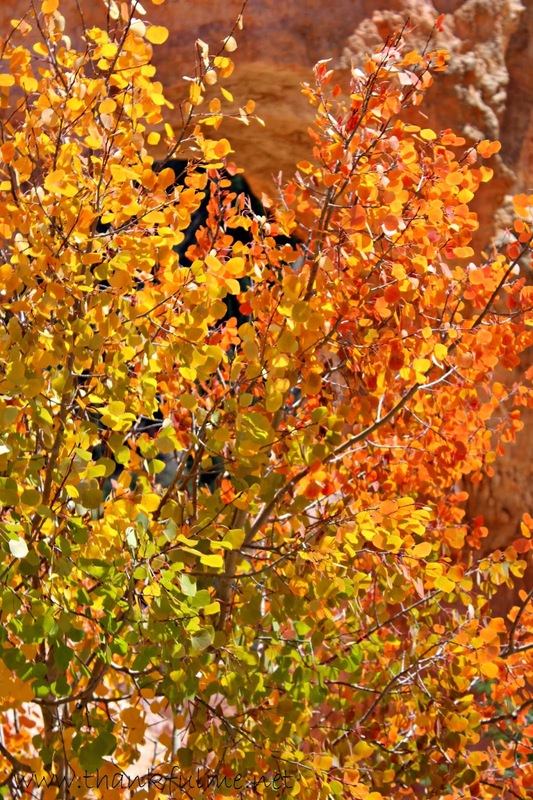 The mountains rose up against a deep blue sky, the trees were ablaze in orange and gold, and, as she tromped through the leaves on the sidewalk, she heard a satisfying crunch, crunch, crunch. I hadn't read yours before I posted mine. Love the poem you created! nicely evocative of a time ago. (for the record I have played in leaf piles, deep enough to allow one to run and jump and land in the center of the pile, cushioned from the ground.) Even more aging, I can recall burning leaves in the fall... that seems so long ago. I love the "crunch" of leaves in Fall, and the "crunch" and "squeak" of snow in Winter. I just noticed the mountains across the valley were dusted with snow last night. Fall is my favorite season and having been born and raised in New England, crunching leaves are a familiar sound! The crunch sound is much better than having a big soggy mess! I enjoyed this romp through the leaves. Could even smell them.